I’ve been a longtime fan of Logitech Harmony remotes having owned several of them in the past. 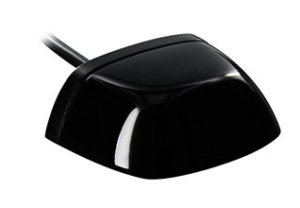 If you aren’t familiar with them, Harmony remotes are programmable universal remotes sold by Logitech, that allow you to automate multiple operations like turning on TV’s DVD’s and other components in home entertainment systems among other things. I had a bit of time over the holidays and decided to upgrade my old Harmony 650 remote to the new Harmony Smart Control system. I even integrated the system with voice control using a Google Home Mini which is a nifty little WIFI enabled speaker that includes Google Assistant. More about that later. The first time I tried Harmony Remotes was over 10 years ago when Harmony was not owned by Logitech and I was blown away by how cool their tech was. These guys were definitely way ahead of their time with a cloud based back end that could access IR remote configurations for every imaginable piece of equipment. You would connect your remote to a PC via USB and using the Harmony software you would tell it what devices you wanted to control. Then it would build a “firmware patch” and upgrade your remote with all the commands necessary to control your equipment. Whoever designed that system is a genius engineer! The Harmony Smart Control is a major evolution of the original Harmony universal remotes and takes it to a new level with WIFI, Bluetooth, home automation and smart phone integration. All the configuration of the hub can now be done via your smartphone over your WIFI network by using the Harmony app. 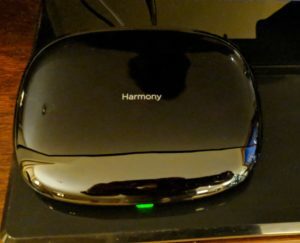 The Harmony Smart Control package includes a Harmony Remote, a Harmony Hub which is the center of the new WIFI enabled Harmony series, and one IR Mini Blaster extender. The hub allows you to control hard to reach IR devices within closed cabinets and supports Wifi, Bluetooth, IR and RF protocols. This makes it capable of controlling several newer devices that don’t use the older IR (infrared) protocol for remote control. Some examples are the Amazon Fire TV, IOT devices and home automation systems like Philips Hue lights etc. Setting up the Harmony Hub is done using the Logitech Harmony app on Android or iOS or by using their standalone desktop app. Programming it is not necessarily the most intuitive thing in the world, but boy once set up its pretty sophisticated and can make some really cumbersome and error prone operations really simple. You first have to wire up the hub and the IR Mini Blaster, which is only needed if you have equipment hidden in a cabinet like I do. I actually was not aware that the hub itself also sends IR commands so ended up unnecessarily buying a second IR blaster (the Smart Control package comes with one extender). The hub communicates with the remote using RF and then sends out all the IR commands as well as other command protocols as needed. The big advantage here is that once you are set up, you no longer have to worry about pointing your remote exactly at your system. The hub takes care of all the messy stuff. Genius! Once you power on the hub, you have to launch the harmony app on your phone to connect it to your WIFI network and finish configuring the hub. 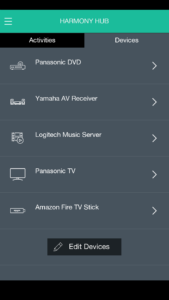 Since I was a previous harmony user, all I had to do was log in to my harmony account and it imported all my configuration settings from my old Harmony 650 remote. Woot! 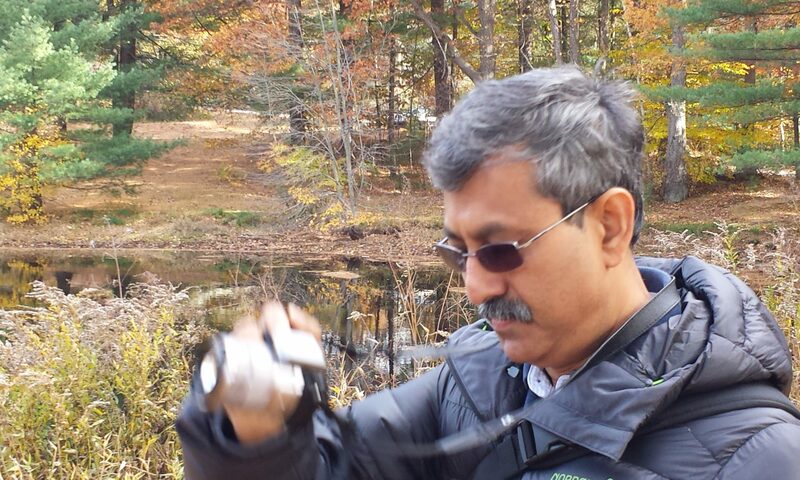 I was immediately able to control my equipment without any major setup time. You literally press one button on the Harmony remote and the Harmony Hub will do all the messy work of turning on and setting up your devices. The other major advantage in this system is that your smartphones can also act as remotes, since all the buttons and commands are available when using the Harmony App on the phone. Although the provided Harmony Remote is simple with only 3 activity buttons you can set up the buttons for long press, to access other activities which is handy and actually space saving. Another thing new for me was having access to non IR devices through the hub as well. 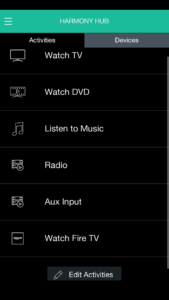 I was able to add an activity to control my Amazon Fire TV Stick which has a custom non IR remote. The hub knows how to send commands to that directly so I can use one remote for everything now! Once I had everything set up and tested with the remote I looked into how it could be integrated with my Google Home Mini. Since the mini understands Google Assistant voice commands I wanted to see if I could get it to talk to the Harmony hub. Took a some research and googling to find out how to do this since there are no instructions in the box. Not a lot of great info available online but I found some notes from Logitech and Google on integrating with Harmony Hub to set this up. You will need to first install the Google Home app from the play store for this, and then ask the Google assistant to link to the harmony hub “Ok Google, ask Harmony to link my account.” This creates a “card” that appears in Google Home and then sign in to your harmony account. Once you get past this non-intuitive mumbo jumbo, this will give the Google assistant access to the Harmony hub and your associated programmed activities. 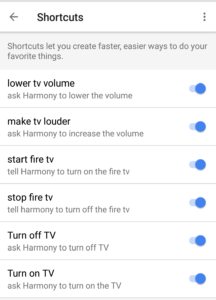 You can now issue voice commands to target the harmony hub, like “Ok Google, ask Harmony to turn on the TV”. Since those commands can be too long to remember, fortunately you can also assign shortcuts in Google Home. You can set up shortcuts from the Settings | Shortcuts menu in the Google Home app. Below is a short video showing my final integration of the Harmony Smart Control with the Google Home Mini to automate my entertainment system using voice commands. EDIT: I’ve had 3 cases where the remote has stopped talking to the hub inexplicably. Finally called Logitech support but after more than an hour of troubleshooting they were unable to figure out the problem. I’m getting Amazon to replace the item since its likely a hardware issue. Resetting the hub and re-pairing the remote seems to fix it but the problem recurs. Here is a link with instructions on how to repair the remote.